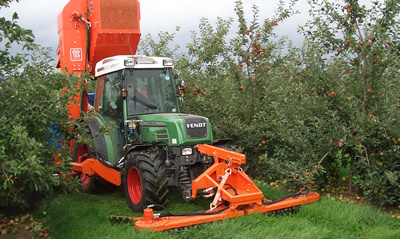 Tuthill Centipede front brushes are mounted at the front of the tractor and clear any fruit lying in the path of the tractor. They clear a path of over 2.6 metres (8.5 feet) giving ample room for a trailer with wide tyres to follow without crushing fruit. The Centipede system clears the fruit quickly so there is no fruit left on the ground when the tractor gets to the end of the row. The brushes fold automatically when lifted. This makes them compact so that turning at the headlands requires less space. The brushes are available in two versions. One version fits onto a standard tractor front three-point linkage. The other version has its own lifting system. Both brushes fold automatically. The brushes have excellent ground following capabilities with a central castored pneumatic height control wheel and individual height control wheels under each brush. The brushes clear a path of over 2.6 metres (8.5 feet). They can be used at speeds up to 10kph (6 mph). When folded the brushes are just 1.00 metres (3 feet) wide.